It’s well-documented that spending time with animals has a really positive effect on our mood. That’s why it’s fairly common for nursing home residents to get visits from therapy dogs and cats, who greatly improve the lives of residents in the few short hours they spend there. 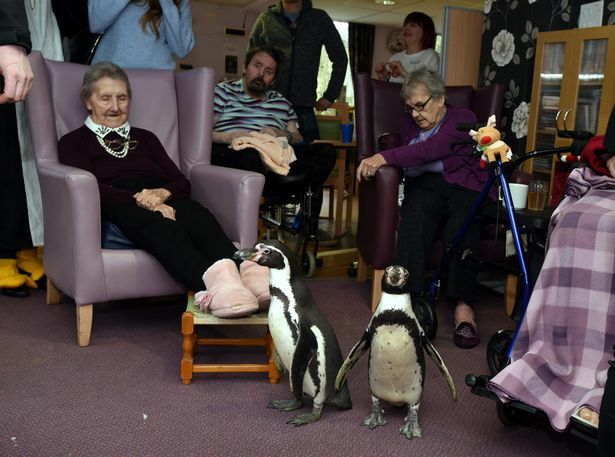 What’s less common, practically unheard of, are visits from therapy penguins, but that’s exactly what residents at Care UK’s Mountbatten Grange, Windsor, got to enjoy recently, when Charlie and Pringle popped in to say hello. 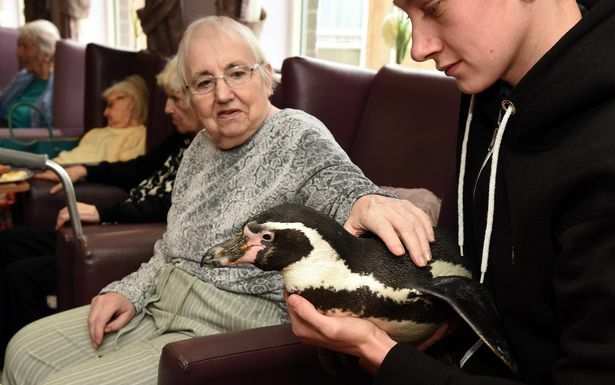 The visit was organised by the team at to surprise resident Annie Thelwell, 92, who absolutely loves penguins and had made the wish to meet them. I’m sure she didn’t expect her wishes to come true, but thankfully they did! Annie has always been an animal lover and has a box of cherished animal photos and wears a unique penguin-shaped pendant at all times. In this rarest of opportunities, Annie got to see the beautiful birds up close and personal. 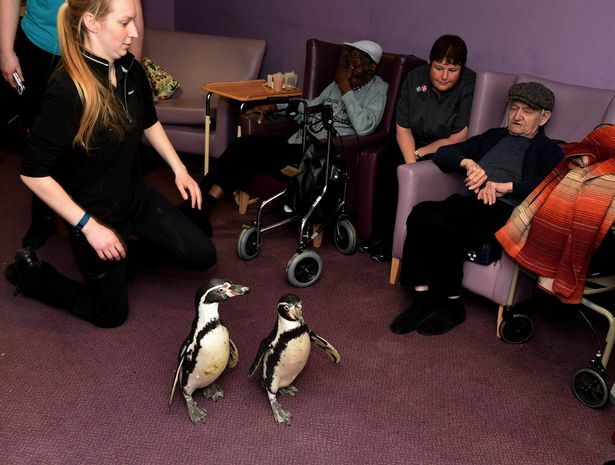 After the penguins’ arrival, the residents quickly broke the ice with a workshop, which gave them the opportunity to find out more about the penguins, assist their handlers’ with feeding them, and generally give them a good love. 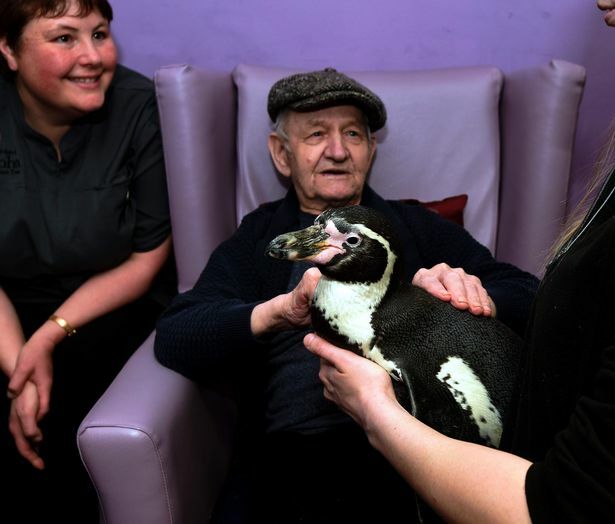 Pringle and Charlie are hand-reared Humboldt penguins and were brought into the home by an organisation called Amazing Animals. They are friendly, calm and relaxed when meeting new people, and regularly attend workshops and educational talks all around the UK. They have previously visited other nursing homes in the UK, such as Trevone House in Gloucester. “Ahead of the visit, we carried out a risk assessment to ensure that both the residents and the penguins would be completely safe and well. Charlie and Pringle were captive bred, as were their parents, meaning they are used to meeting new people.They have worked in the film industry for many years under the experienced guidance of a company that has worked with animals in films for over 40 years,” he said. The penguins usually live in a special enclosure with a swimming pool, pebbled beach and penguin house at Heythrop Zoo, and are kept within in a breeding group to ensure social interaction. Originating from South America, the animals are native to warm weather but can quickly adjust to different environments. 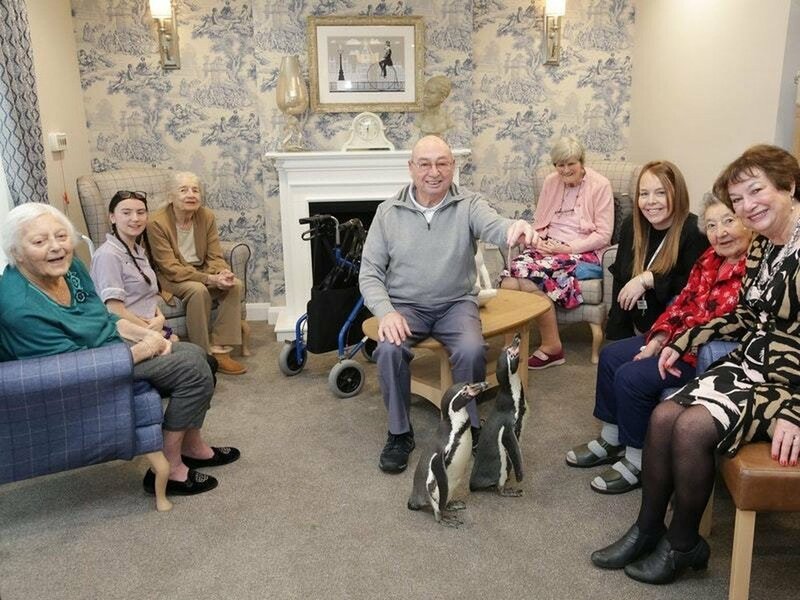 The penguins regularly meet new people during their workshops and educational talks all around the UK to raise the general public’s awareness of conservation issues. As you can see, they’re very sociable. 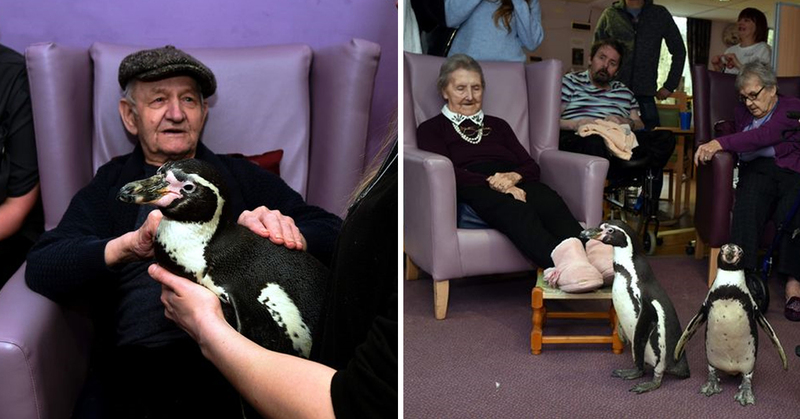 Penguin-lover Annie and the rest of the residents were very happy with the visit, as you can tell from the pictures. 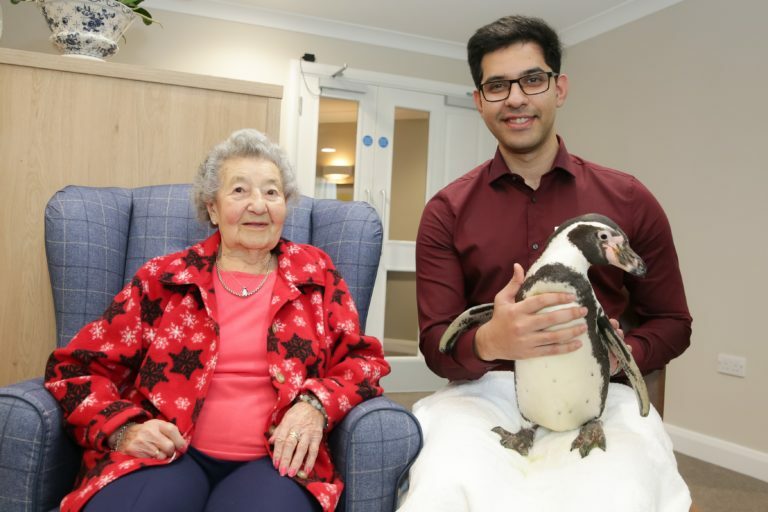 “We always like to go the extra-mile for residents here at Mountbatten Grange, and make their wishes come true, no matter how small – or unusual,” said Saad. “Annie talks about penguins with passion, so we were really excited to be able to make her dream of seeing one up close come true. 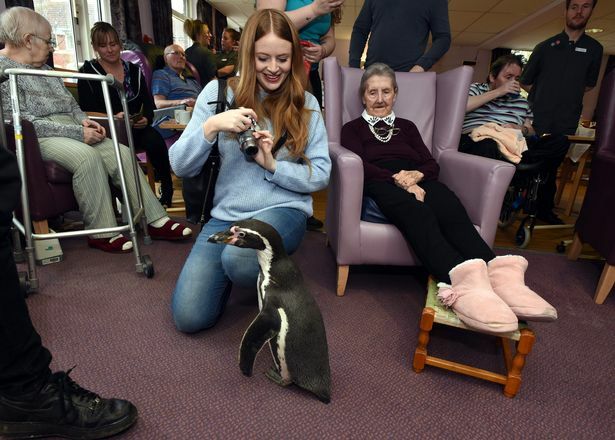 We managed to keep the visit a complete surprise, so it was incredible to see her light up when they waddled into the care home – they are truly wonderful creatures and it was a fantastic moment for everyone involved,” said Saad Baig. It’s really special that they were able to give their residents a nice surprise like this. I wish I could have been there to see it!